Workflow is the business process according to which customer requests are processed in Helpdesk. The workflow concept rests on the following three “pillars”: sources, states, and actions. Email. Ordinary email messages sent to your company's addresses. You simply need to connect those address to Helpdesk so that it can retrieve customer requests and display them in the backend for you to work with. Web form. A widely used method of collecting feedback from website visitors: a simple form with fields for customer's name, email address, and the message text. You may set up and publish any number of such forms on your various websites. Customer Portal. This is a password-protected part of your website, which is created for and can be accessed only by those of your website visitors who have sent you at least one support request; the Customer Portal displays customer's entire correspondence with your support team and offers the option of sending new requests. State means the status of a customer request at a certain moment of time. Here are examples of states: “new”, “discussion”, “closed”, etc. In Helpdesk, the workflow is freely adjustable; therefore, you can create as many states as you need. Action is the transition from one state to another. Examples of actions: “Reply to customer”, “Add comment”. Most actions are usually performed by backend users, but you can also make some of them available to your clients in the Customer Portal; e.g., “Cancel” (if the client has found the solution and no longer needs a response from you) or “Reopen” (for requests that need clarification). There are also actions, which are automatically performed under certain conditions; e.g., when an additional message received from a client changes the state of an existing request. Explanation: A request was received by email, so its source is the mail box to which the customer sent an message. Once the request was retrieved by Helpdesk from that mail box, it was assigned the “New” status. Upon execution of the “Reply” action, its state was changed to “Closed”. A workflow must contain at least 1 source. Otherwise your clients' requests will never appear in Helpdesk. A workflow must contain at least 1 state. You can perform some actions with a request only if it is assigned some state. To move a request to another (target) state, you need to perform an action, which must be available for that specific (source) state. 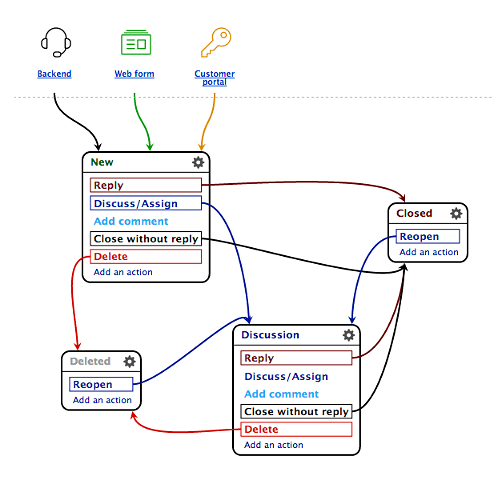 If no action (arrow) points to some state in your workflow diagram, then no request can ever be assigned that state. An action does not necessarily have to change the state of a request. For example, action “Add comment” will leave a request in its current state. A workflow may contain an unlimited number of states. To be able to assign those states to customer requests, add corresponding actions “pointing” to those states. You may define an unlimited number of actions available for each state. A state may contain no available actions. Should a request be assigned such an “empty” state, its state cannot be changed any more. Each action may be available in multiple states. For example, you can perform action “Reply” both in “New” and in “Discussion” states.